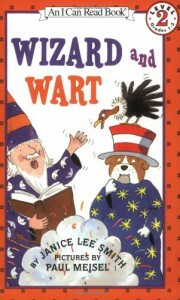 At first glance, it may seem a little thicker than most level 2 I Can Read books, but with the story separated into four sections, Wizard and Wart is a pretty easy read. I have to say, I really like the fact that the story uses directional words in different ways to show out the Wizard interacts with his customers. The story itself is cute and the artwork is pretty standard for a children's book, but I have to say I'm not left with a lot of feeling about Wizard and Wart. It's one of those books that was cute the first time, but I'm glad I got it from the library.